Photo by Ulysse Lemerise Bouchard. 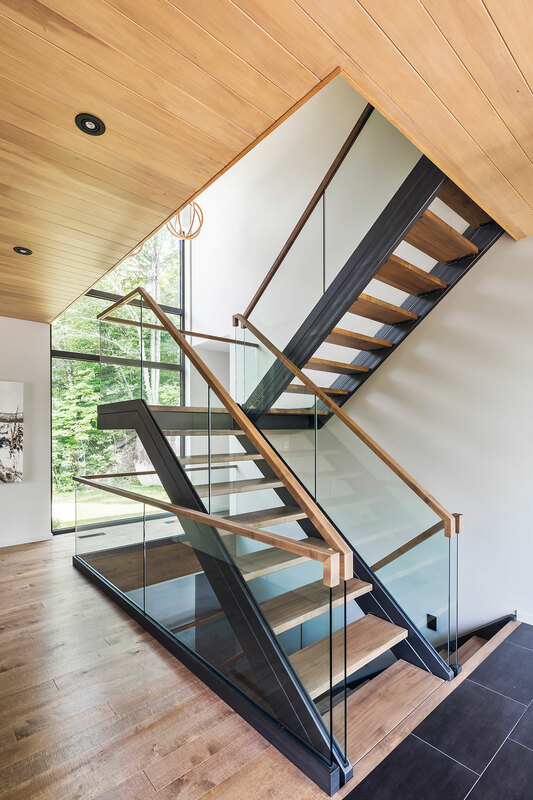 The rocky topography and steep inclines surrounding the shores of Lac de la Cabane in St-Adolphe d'Howard in Canada's Quebec province played an instrumental role in MU Architecture's design for Estrade Residence, a private home for a family with kids. 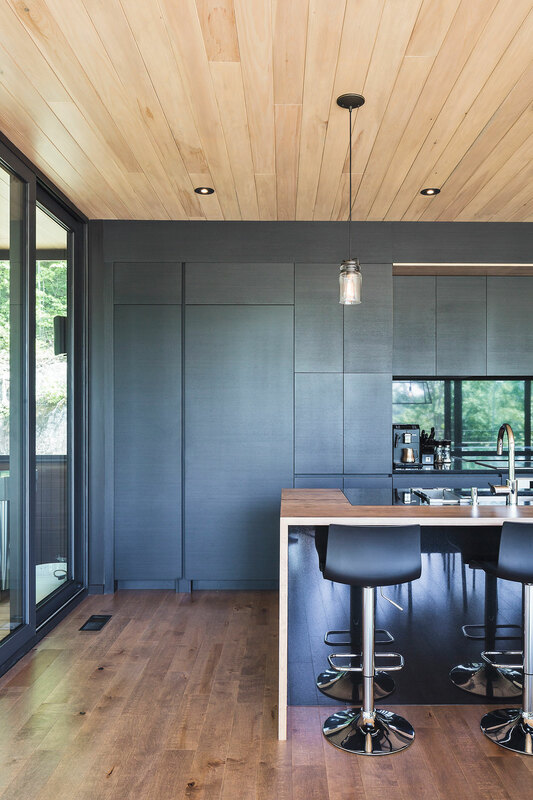 Although boasting and spread over all of 3,600 square feet, all design and construction elements of this home - which was completed in December of 2015 - conspire to create a cozy, welcoming and enveloping atmosphere for those lucky enough to experience it. 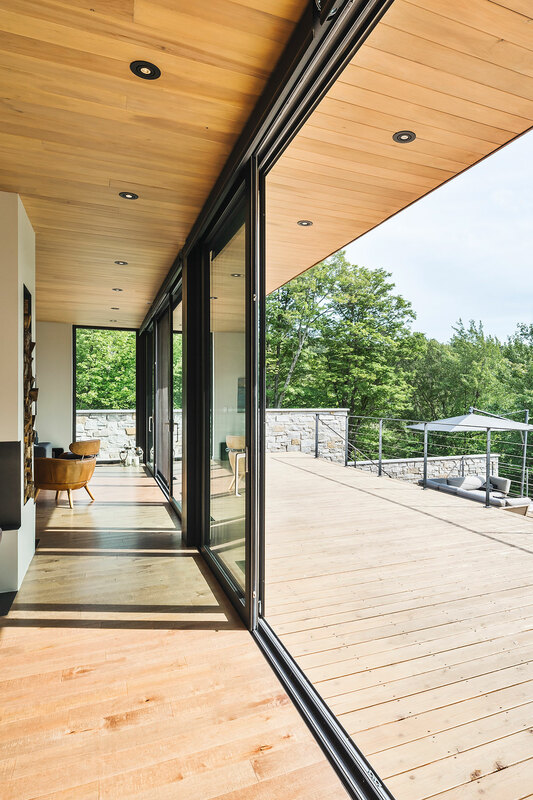 MU's project team - comprised of architects, Jean-Sébastien Herr, Charles Côté, Jean-Philippe Bellemare, Pierre-Alexandre Rhéaume and Floriane Deléglise - chose to use the home's exterior environment as their starting point, thereby incorporating and highlighting as much natural wood and stone within the construction as possible. 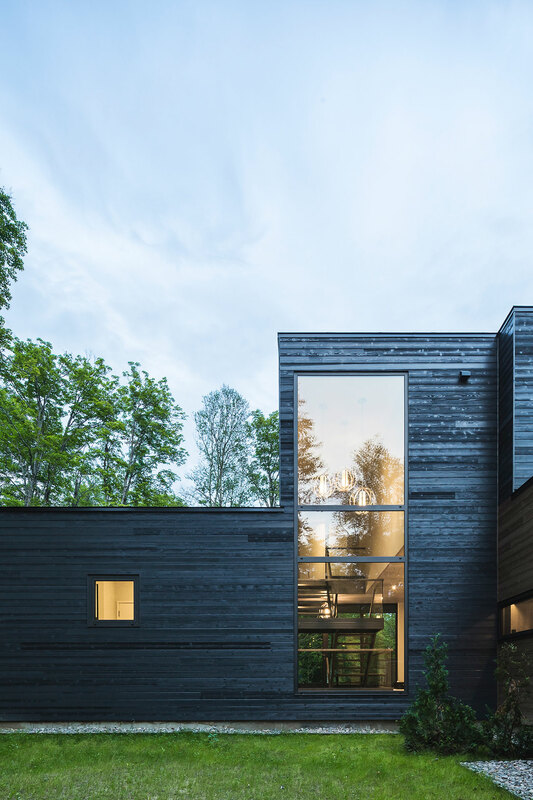 Next, a multitude of unfolding layers which embrace the quirks of the site, the home is perched on a steep ridge directly overlooking the lake, reveal the outside to the inside and vice versa. 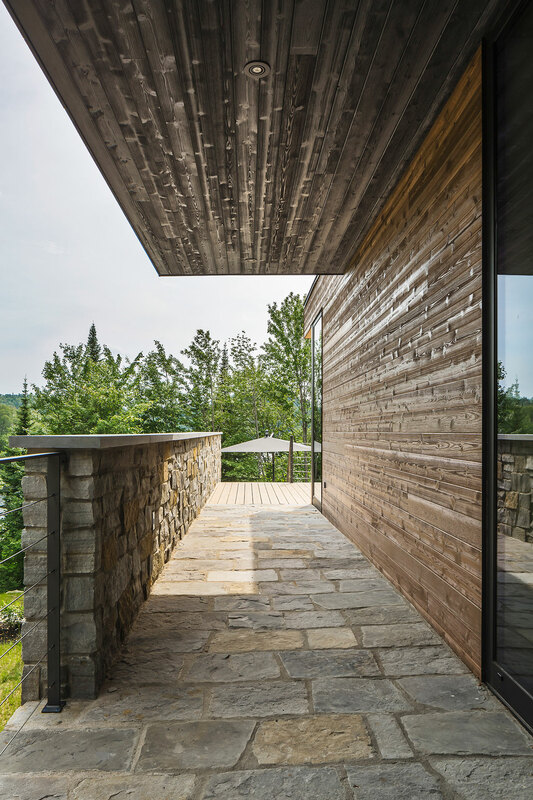 As such, the stones which were extracted during the site's construction process have been utilized to form the long wall which runs the length of the exterior's lower floor levels, anchoring the home into the ground. These same stones are also used throughout the garden's lush landscaping, creating its walls and pathways - including those around the outdoor Jacuzzi. Wide terraces have been nestled throughout the home's various layers, starting with the immense veranda that extends from the open plan, ground floor level. 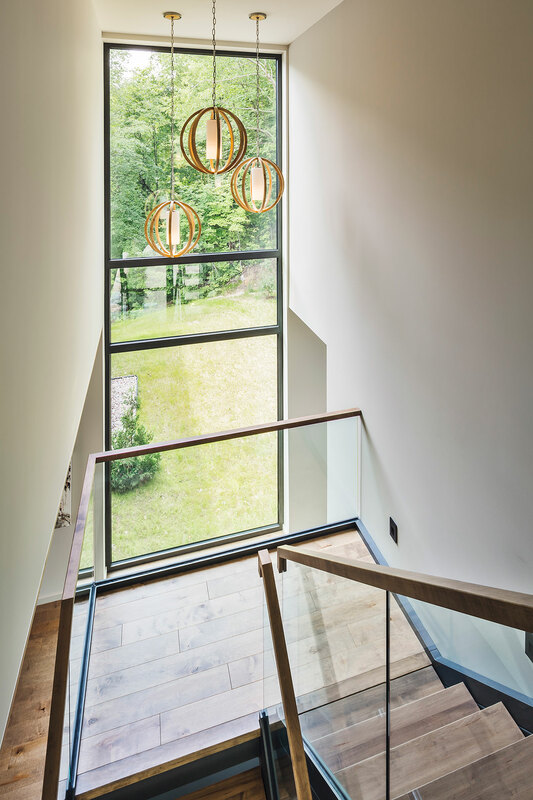 Here, residents and visitors alike are welcomed into the home with a hit of natural sunlight that bathes the space through the tall, wide glass windows which lead to a magnificent view over the lake. 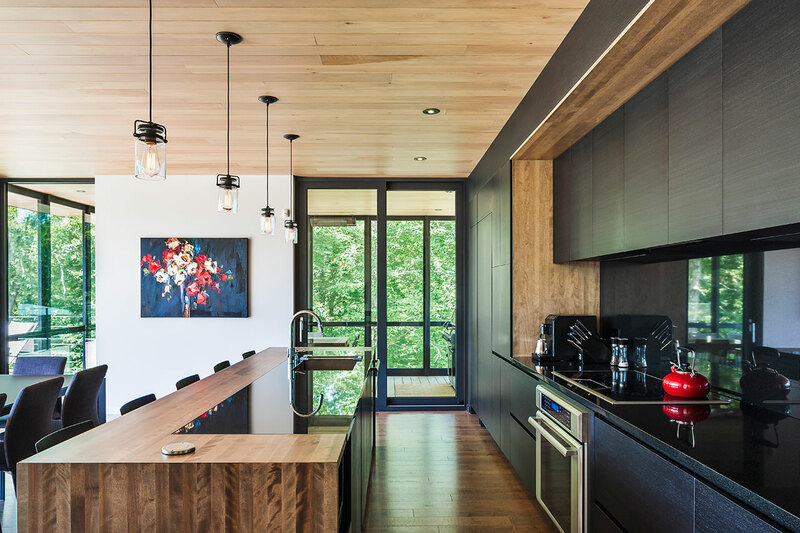 The open-plan kitchen/living room is tied together by a double-sided fireplace in the center of the space as well as by the natural cedar wood floors and ceiling. 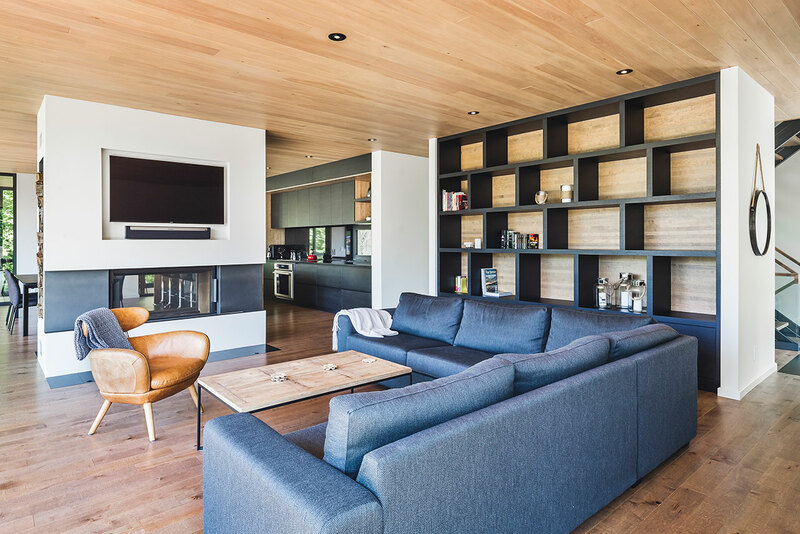 "Warm minimalism" could indeed be the term used to describe the furnishings, seen in the comfy gray sofas, leather clad chairs, and wood-topped tables in the living room which beautifully complement the in-built, ash-black kitchen furniture and wood-wrapped counter top. 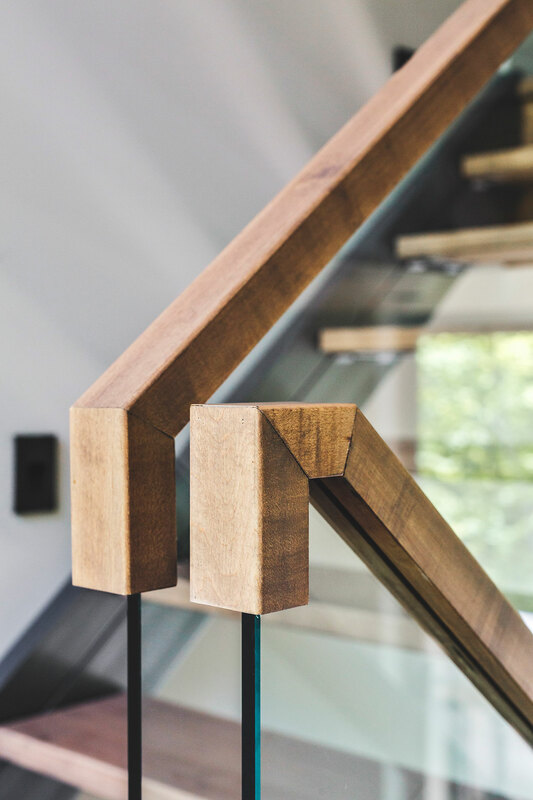 Up the cedar wood staircase with glass balustrades leads to the seclusion of the private parental suite, complete with bathroom and enviably large walk-in closet. Definitely grown up, this tranquil environment is all about wood walls and small design luxuries such as the shiny, brick-like tiles in the bathroom over the soaking tub.